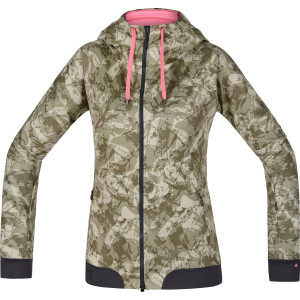 Technical conjures images of skin-tight fits and carbon-infused fabrics, but the Power Trail Lady WindStopper Hooded Softshell Jacket from Gore Bike Wear proves that tech gear doesn't have to be so one dimensional. At first glance, the Power Trail looks like a casual hoodie -- and can be worn as one -- but the low-key look conceals a WindStopper membrane, which prevents the breeze from cutting to your core when you're out for a foggy spring or crisp fall trail ride. WindStopper is also highly breathable, so you won't become clammy when you pedal hard over the crest and freewheel into a flowy downhill. The fit falls between tailored and relaxed, so the Power Trail is at home grabbing a post-ride coffee, putting down long singletrack climbs, and sweeping through fast technical descents on canyon roads. The draw cord hood flips up when the weather at the trailhead is chilly, but conceals a magnet that holds it securely against your back to stop it flapping in the breeze when you're in the saddle. Zippered pockets at the front and on the sleeve hold your energy gels, keys, and phone, and reflective details on the back and sleeves help you stay visible when you ride a mile along the pre-dawn road to beat the crowds to your favorite trail.